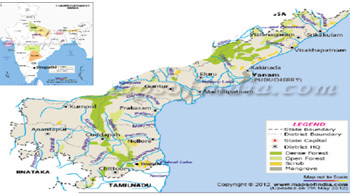 The region selected comprises two districts of Chittoor and Kadapa which are strewn with mountains, valleys, forests, plains with agricultural lands and two coastal districts of Nellore and Prakasam with farm lands, wetlands, shrimp farms and islands with a total population of 13.2 million. There are 10 universities, 200 colleges in the area. Tirupati zone in Chittoor district is very special region because of flux of 20,000 to 50,000 people per day visiting the shrine up the hill at Tirumala. The area is rich in cultural diversity with artisans and artists. The tribal communities are present in all the districts. The two coastal districts have rich marine biodiversity and are prone for storm surges and tidal waves. This was part of Tsunami hit region The states of Telengana and Andhra Pradesh have no RCEs so far. If RCE-Tirupati is started it might in future cater to the extended region of central and northern Andhra Pradesh and Orissa. Train communities on practical aspects of Watershed and Water harvesting Use of terrace roof tops for rain water harvesting and hygienic storage techniques In suburban areas, communities will be shown the methods of trench and barrel techniques for storage Create awareness of water reuse and management To tide over energy crunch, efforts will be made to promote use solar panels with the help of department of Non and New energy sources for affordable institutions and residences. Only two residences have installed solar panels in Tirupati and one of them is that of 1st contact person which is serving as model. In schools, colleges and offices tree plantation will be encouraged with the involvement of students with the help of social forestry division of A.P. Govt. and forest department of TTD. A.P forest department and Tirumala Tirupati Devasthanam will be requested to install towers with sensors to signal to detect forest fires Rural communities in the forest fringe areas of Seshachalam hill range will be sensitized to send mobile signals about any clandestine activity. Ecology and Environment: Chittoor and Kadapa districts are part of Velikonda range of Eastern Ghats Mountains with rich wild life, plant and animal biodiversity including medicinal plants. Pterocarpus santalinus the famous Red Sander tree grown extensively in Chittoor and Kadapa districts has export value and is being smuggled out relentlessly despite State and Federal measuresof control. It is believed that this species is very endemic and grows in these two districts only. The Chief Minister and Forest Minister of newly formed Andhra Pradesh have announced that a ‘Red Sander’ institute will be opened in Tirupati to study its properties and propagation. Except Nellore district all the other 3 districts of the chosen area depend mostly on tube wells all round the year except in the monsoon months for agriculture and horticulture. Most critical is the drinking water. It is a common sight in all the towns truck tankers and tractor tankers carrying water for residential and industrial use. This water is not drinkable and purified water is sold at Rs.10-20 per 20 litres on a large scale by commercial public distribution. The municipalities and corporations supply water once in a week to homes. Water management practices are rarely noticed. The shift in land use pattern from agriculture to industry in urban, semi urban and even in rural areas has created a stressful situation to ecosystem as water, soil and biodiversity are interconnected. 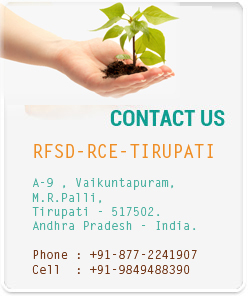 Education Domain: RCE-ESD Tirupati area has large number of educational Institutions, Primary, Secondary and Higher. In Tirupati there are many universities namely: Sri Venkatswara university, Sri Padmavathi Mahila university, S.V. Veterinary university, and S.V. Institute of Medical Sciences. In Kadapa Yogi Vemana University and Rural University are located. In Kuppam Dravidian university and in Nellore Vikrama Simhapuri University are located. Of these, S.V.University and Dravidian Universities have consented to be in RCE network. Sri Venkaeswara university school, Sri Vidyaniketan High School from Chittoor and Sri Chaitanya High School, Tanguturu, Prakasam District and many schools from Kavali town are in the network. Some more primary and secondary schools have offered to work with RCE. Culture: People of urban and rural Andhra Pradesh are known for cultural richness delivering social messages through dance(village ballet) ,drama(one act play), burrakatha (3 member group Song mode), tholu-bommalata (Shadow puppet show) . Economy: Chittoor: Agriculture and Export Economy is based on Mango and Mango pulp. Handloom and Textiles are being developed. Kadapa: Agriculture- Groundnut, Millets, Turmeric, Chillies and Cotton. Granite, Barites, Lime stone are exported; cement is the major industry. Nellore district grows Cotton, Millets, Rice and the major export items are the sea-foods and leather.